I’d watch the weight of all those magazines in one drawer. The bottoms of my drawers came out because of the weight of the patterns in them and the backs also bowed a bit because I tried to stuff too many in one drawer. The only solution I could come up with was to tape the drawer together with long strips from underneath up the back, there was nowhere to nail it to make it stronger. I do love the chest of drawers though, I made some makeshift dividers until I get around to doing nicer ones and it’s so nice to be able to ‘shop’ the patterns and know where they are all! I know, I know, sewing stuff just seems to spill everywhere! As soon as I organize one area, another one scatters itself around. Something we sewers can’t get too bent out of shape about, otherwise we couldn’t apply ourselves, we’d just be cleaning all the time. I’m so doing this cabinet for my patterns. Your organizing is coming along great! I wish I had room in my sewing space (or apt in general) for something like that, boo. But good for you, it’s a great idea! I did play copycat yesterday with your idea to photocopy the Styles at a Glance pages from my BWOFS. It’s really useful for me to have both the line drawings easily accessible, and the photos organized on my laptop because I actually look through my Burdas both ways. Sometimes I’m looking for a particular cut, so I want the line drawings. Other times I’m looking for overall effect, so then the photos are what I need. Oh, and I had a thought about the ties for the obi 151. I made a couple of them today and wonder if it’s not just another translation-typo. Maybe you’re only supposed to cut 1 strip of the given length and use it for both? When I considered the measurement, half that seemed like it could be about right. You may not feel like it makes a big difference in the sewing room mess, but not being able to start your jacket because you can’t find the jacket is a huge pain. So congratulations, that looks a lot better! I may second the caution about the weight of the magazine though… And I put my Burdas in vertical magazine files, and I feel I can find them easier, and browse them more often, than when I have them flat, but to each her own. At least you have them all together, it’s huge progress. Now for that jacket :-)? I’ve looked at the Aneboda sooooo often. In reality, I need 2, but my dd usually reminds me that I have no place to put it. When I ask her, ‘what do you mean, no place?’ She’ll say, mom you have no place on the floor for it to stand! ROLMHO…..guess my sewing room is so jam packed. Yes, we have this conversation every time I stand before it in IKEA. Oh, did you see that SewingPatterns.com is having a $1.99 Simplicity sale? For me, this is incredible because I don’t have access to your .99cents sale and we never ever have pattern sales here. Of course, I got my 10 patterns in. Hey, you need more patterns! But then you’re still young :-). That’s a very nice cabinet. Good luck chipping away at the sewing room contents. Every little bit helps. FYI – you know you can stand those magazines on their side, spine up, right? Ooh, that’s a really pretty cabinet! I must agree with Anna – the Anaboda drawers cannot hold that much weight. The gliders are not that strong and the bottom may pop out. Sorry to discourage you on that one. My dh had to put back together some drawers in a my dd’s Ikea dresser, not this one, but it just didn’t hold together with just clothing in it I don’t give it much hope for a drawer full of magazines. The magazine holders are pretty cheap and a whole year’s worth of magazines will fit in one holder, especially if you’ve taken out the pattern sheets. They make it much easier to put your hands on the issue you need. Thanks for the warning everyone. I’ve pulled the magazines for now until my magazine holders come in. THX! Looking good! 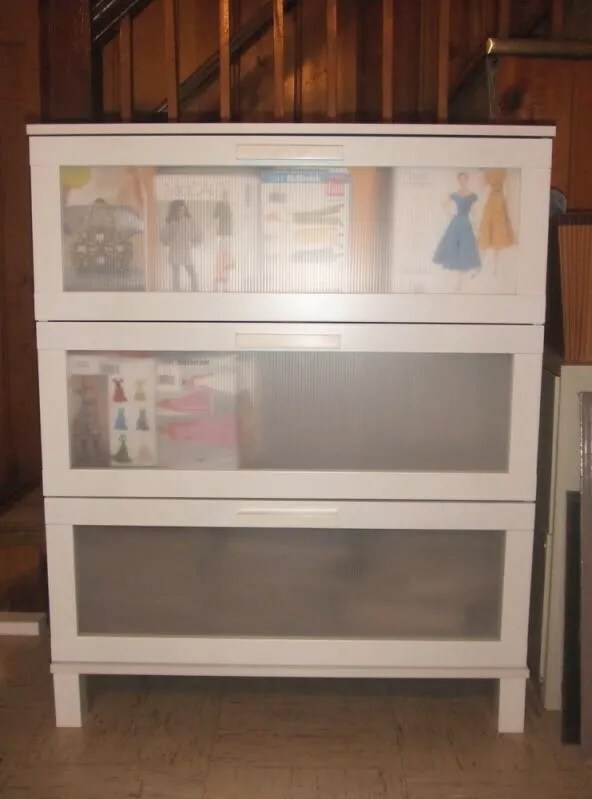 I was so lucky a few years ago to get a real pattern cabinet at an auction sale for 5 bucks! I don’t think anyone else knew what it was! Love the cabinet . . . it’s so great when you get your patterns organized! Are these cabinet drawers large (high) enough to properly store the Vogue designer patterns (7 3/4″x 10″)? When I store these in my overpriced Olfa drawers, they get a bit smooshed, even when they’re filed using the shortest side. Yes, they sure do! The Hot Patterns and Jalie are too tall, but the Vogue Designer patterns fit perfectly! Waow..I wish I was organised as you. Most of the time, I can’t even find my magazines. 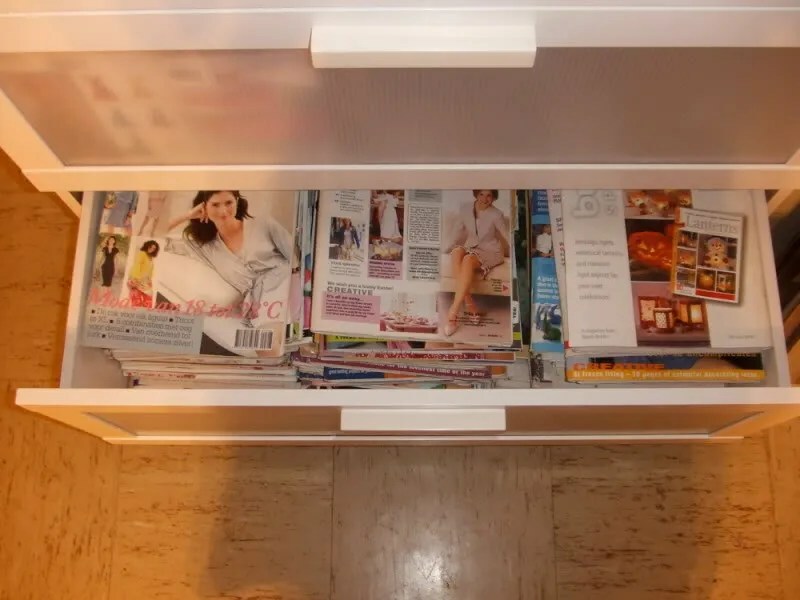 I guess I have to seriously consider a drawer just for my magazines and patterns, like you. Good job.